Alexandra Murray Harrison, M.D. is a Training and Supervising Analyst at the Boston Psychoanalytic Society and Institute in Adult and Child and Adolescent Psychoanalysis, an Assistant Clinical Professor of Psychiatry, Harvard Medical School at the Cambridge Health Alliance, and on the Faculty of the Infant-Parent Mental Health Post Graduate Certificate Program at University of Massachusetts Boston. Dr. Harrison has a private practice in both adult and child psychoanalysis and psychiatry. On Saturday and Sunday, June 2 and 3, The Cambridge Ellis School hosted a training on treating autistic spectrum and other children with serious dysregulation syndromes in the preschool classrooms. 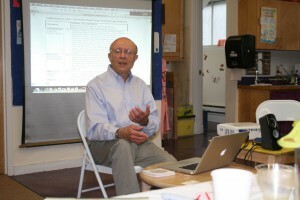 The training was led by Dr. Gil Kliman, the recipient of many awards, including an International Prize for World’s best book concerning the well-being and nurture of children. Dr. Kliman has worked intensively with preschool children for over forty years and has developed a method for treating seriously troubled children in their own world their preschool classroom. It is called, The Cornerstone Method, or Reflective Network Therapy. I was honored to assist him in this important training. In the first day of the training, Dr. Kliman showed us many videos. In one of them a little boy, Lonny, had withdrawn in anger after another boy had “wrecked” his tea party. After the essential briefing by the teacher, Dr. Kliman approached the boy. Getting down to his level where was hiding under the table, Dr. Kliman began to sing a song about a ruined tea party, with many verses about what had happened and how the party had been spoiled by the uninvited intrusion of the other boy. Lonny, an autistic spectrum disorder (ASD) child who was prone to aggressive outbursts, began to calm. By the end of the play, the offending child was welcomed into the tea party. The day was filled with fascinating videos of children in treatment in the classroom. Another child was very agitated because of having witnessed domestic violence at home, including having seen his father throw a cup of scalding coffee in his mother’s face that morning. Despite his dysreguation, he was engaged by the therapist, with his teacher’s help, and finally began to build towers that seemed to represent houses that were unsafe, kept falling down. After a while of continuing to build structures with the therapist and a peer, the structures became increasingly solid, representing the safety the child could experience when he felt acknowledged and understood.